I samband med konstnären Oleks utställning på Avesta Art fick Barnebys chansen att intervjua Olek – läs ett spännande samtal om konstens syfte, skapandeprocesser och materialval. Här kan du läsa mer om Oleks återkomst på Avesta Art. How did you get in contact with the Syrian women in Avesta when you first decided to do your installation in Avesta? I asked the museum to help me to get connected with refugees who might need work. We posted a call for participation in the school where they were learning Swedish. 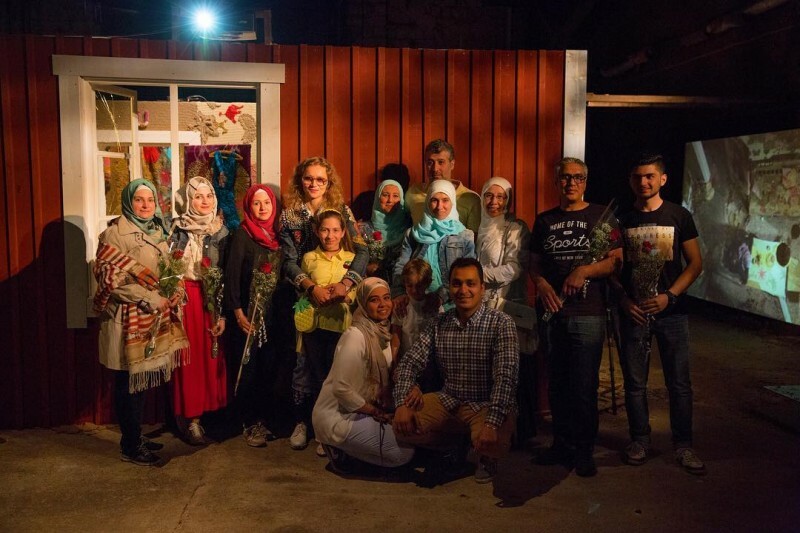 How has meeting the Syrian women in Avesta affected you and your artistic work? A Holocaust survivor said that to save a life is to save a world, as you never know what the person you saved nor his or her prodigy will go on to contribute to the peace and healing of the world. The women taught me a lot. And what I got from meeting them goes beyond the physical existence of my installation. Yes, visually I was able to create a much more powerful installation than originally planned. But I value even more the strength they gave me. The strength to know what is important in life and the strength to fight for it. I hope to inspire, and to create work for a cause. What were the town’s reactions, if you’ve seen any yourself, or heard what people have been saying? It is hard to answer for others but since it has been my 3rd year there, I think they might like me a bit. How do you think your presence and work has affected the Syrian women living in Avesta? I think it would be best to ask them. 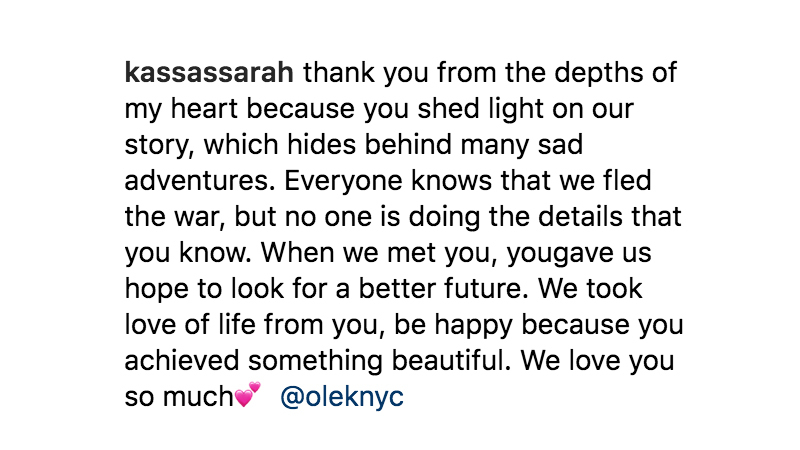 Here is a recent comment made by Sarah under my post. This is everything to me. This gives me a reason to continue. How has exhibiting in Avesta been different from other places in the world where you have created and shown your work? Every place is different and opens doors to endless new possibilities. Avesta is not just the museum, the cold walls, or the gigantic dalahäst sculpture. Avesta stole my heart with its charms. Everyone who works at the Avesta Museum is doing more than just a job. They are there to fulfil artists’ dreams and desires. I really wish for myself and other artists to always be supported by this kind of team, especially when working on a deadline. I have to say, I got spoiled for life! Your main art mediums, crochet and video art, are two quite different forms and contrast in many ways. Both when it comes to their history and use. How did you start using these forms and what do they mean to you? Has your art evolved in any way by mixing the two mediums? My work is a never-ending, crocheted journey, embellished with emotions, memories, experiences, thoughts, and insights, it’s also affected by the people I meet and the dialogues we have. Most of all, it’s about recording the ephemeral moments of street- and performance art. I realized very quickly that crochet techniques gave me endless opportunities. It has been over a decade or two since I employed my crochet hook as my language to transform my thoughts, dreams, and desires into reality. The same hook took me to various places around the world, got me connected to diverse communities, and allowed me to create a few communities of my own. I hope to inspire, and to create work for a cause. Crochet is the language that allows me to illustrate my ideas. And as any language it has endless possibilities for self-expression. My video work has been an additional element to my work for over 10 years now, it allows me to document those ephemeral, Fluxus-like moments can never be recreated. I like to mix the old-fashioned technique of crocheting with new media. I’m interested in discussing and exploring the hierarchy of materials within a sculpture. 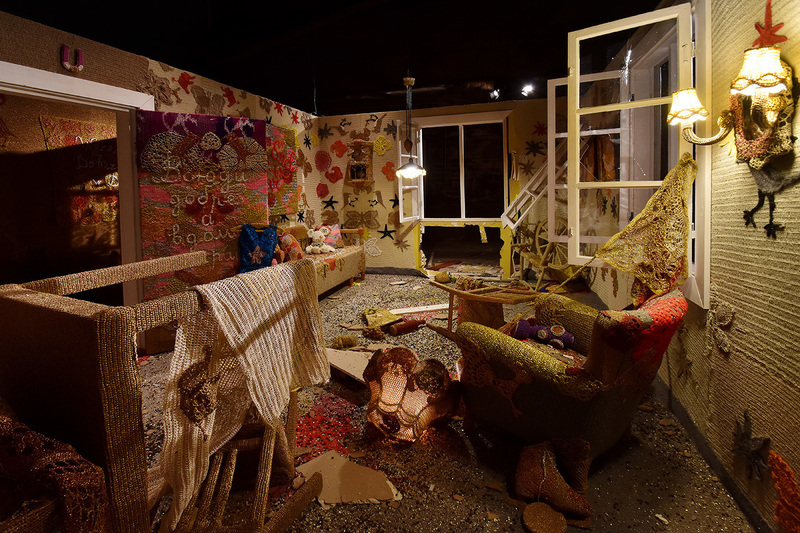 In your first work at Avesta Art you blew your installation in pieces. I understand the Syrian women helping you with the project was an inspiration. In your previous work have you created work on the same theme? Never underestimate what a place might bring to you as an artist. Originally, I rejected the invitation to take part in the show at the Avesta/Verket Museum. When the museum asked me to participate, I thought, it was a small town, I did not know the artists in the show, and I did not know if I wanted to put my effort into working with them. However, I gave them a chance, and I created one of the most important pieces, I think, in my career. It showed me that we have to start with small communities to make a big change. I was commissioned to make a site-specific installation for a group exhibition entitled, “Structure”. Months before the installation even started, I spent a couple of days in Avesta searching for inspiration. I was inspired by a small museum in town that showed a traditional Swedish home, and I had originally intended to recreate it. It was the summer of 2015 and the refugee crisis was exploding. Since I always work with assistants, I asked the museum to help me get connected with refugees who might need work. In Avesta, after a couple of days of crocheting, sewing, listening to audiobooks and music from various countries, we broke the ice and a conversation started that has changed me forever. It is one thing to read about the events in those parts of the world, but it is something totally different to actually look in the eyes of those women who lost everything while running from the war. It was also a few days after the Brussels airport terrorist attack, and one could feel the tension in the air in Europe. People started to turn their backs on those who needed help. Lama, who escaped the war in Syria, showed me pictures of her hometown before and after the bomb attack. I felt anger and frustration that I couldn’t do anything to stop it. One day I saw Lama crying. She explained it was her wedding anniversary but she couldn’t spend it with her family as her mother and brother ended up in Germany. I know the feeling of not being able to leave the country you reside in while you are waiting for papers. I myself was not able to leave the USA for the first 5 years, but unlike Lama, I escaped my home country voluntarily. Those women not only lost their physical homes due to the war conflict, they also lost the feeling of belonging as their families got separated. The idea of exploding the house became clearer and clearer to me. I approached Lama, even before talking to the museum director, and explained to her my new drastic idea. First, she reacted like most people saying, “Oh no, so much work will be destroyed.” Then she said she supported my concept, which was very important to me. The next day her husband, who had been helping us quite often, brought me a folder with many photographs from their hometown, including their own house and other homes before and after explosions, as a source for my inspiration. I don’t think I can find words to describe this moment. I was also very lucky to work with professionals like the museum director Kenneth Lindén and the curator, Caroline Gustafsson. They understood how strong and necessary the concept was and allowed me to explode the commissioned work inside the museum. I still remember arriving 5 minutes before the press opening with the freshly edited film, “In the Blink of an Eye.” We pressed play. Together with the ladies and their families, holding hands we watched the film next to the exploded installation. We cried. Lama and her family said thank you. They expressed how thankful they were for my work. I hoped to move people with my film. I wanted them to feel, even if just for a second, what it might mean to lose everything. I hope my work illustrated the current, unfortunate situation where hundreds of thousands of people are displaced worldwide. But this was not the end of our story. Those women became very inspirational to me because, no matter how low life had brought them, they still found the energy to recreate their lives. That’s why, the same evening, I proposed to work on a public piece, Our Pink House, which demonstrates a woman’s ability to recreate herself and get back on her feet, anew. The pink house, our pink house is a symbol of a bright future filled with hope. And this is a subject for another beautiful story.